Good afternoon, Director Szonyi, Director Goldstein, ladies and gentlemen, this is my greatest honor and pleasure to be here today and to begin with, I would like to express my appreciation for the long term friendship between the United States and the R. O. C., and for the support from the US government and its people, so we can engage and cooperate closely. 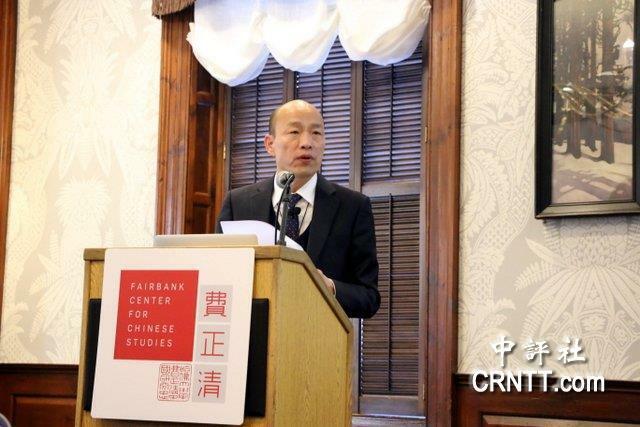 I am more than honored to have this amazing opportunity standing at this podium, in front of the distinguished scholars at the Fairbank Center for Chinese Studies, the most esteemed institution of Chinese Studies in the world, to share my story and to talk about what I think and what I want to do as Mayor of Kaohsiung. In Taiwan, there are a lot of people calling me a “produce vendor.” Mainly because I worked in a local agricultural products marketing company before I ran in the Mayor election. The media often describes me with the term “down to earth,” and few individuals even name me “country bumpkin” for my humble origins, and my rather direct and unrefined language. Well today, this bald country bumpkin from Taiwan is standing before you, on the campus of one of the most prestigious universities in the world: Harvard! A few months ago, many could not have imagined this, even in their wildest dreams!